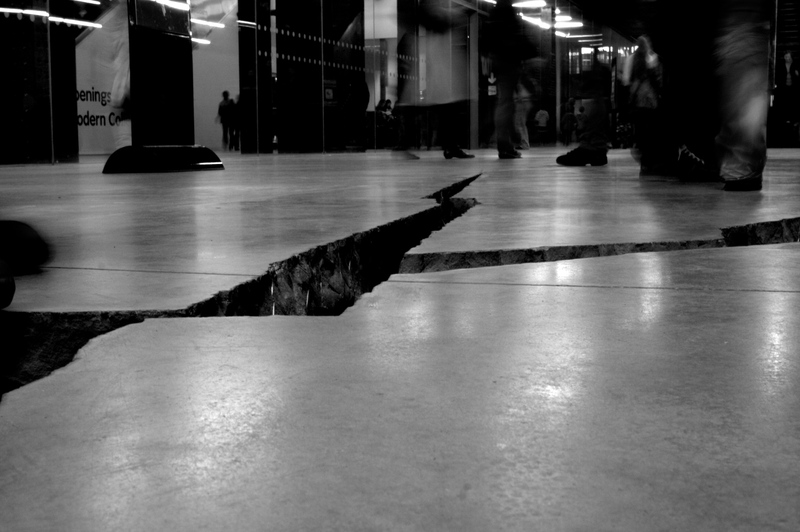 Shibboleth by Doris Salcedo, Tate Modern, London. Photo by Peter Harding on Flickr. Abstract: This essay asks to what extent, and how, literary scholarship can contribute to questions raised by migration. To answer this question, I explore how literary texts are themselves the scene of migratory processes; that is, I focus on migration as a phenomenon of language. This focus leads me to the topic of literary multilingualism, which can be described as the migration of elements of linguistic structures into (and within) texts. I specify how the "immigration laws" of literature, as I call them, are different from the immigration laws of language, and how they are related to literature’s politico-cultural agency. This focus leads to an exploration of multilingual philology as a program of literary scholarship. I examine Paul Celan’s poem, "Shibboleth," as an example of such scholarly study in World Literature, and conclude with thoughts regarding multilingual philology and digitization. This essay asks to what extent, and how, literary scholarship can contribute to questions raised by migration. More precisely, I want to go beyond the obvious answer, that there are many literary texts that deal with migration and thereby provide literary scholars the opportunity to think about the topic. Certainly, this approach is very productive and has triggered a lot of exciting scholarship. It also, however, runs the risk of overstating the case of literary studies. As literary scholars, we have the competence to think about (literary) texts, but this does not necessarily mean that we have the competence to contribute to the corpus regarding migration as a societal phenomenon—which is, however, what many of us implicitly or explicitly try to do. My question, therefore, is to what extent, and how, can literary scholarship legitimately follow its interest in the effects of migration on society without trespassing into the realms of sociology, economics, and the political sciences. This essay asks to what extent, and how, literary scholarship can contribute to questions raised by migration. To answer this question, I will explore how literary texts are themselves the scene of migratory processes; that is, I will focus on migration as a phenomenon of language. This focus leads me to the topic of literary multilingualism, which can be described as the migration of linguistic elements of structures into (and within) texts. Of course, it is often the description of migratory experiences which results in literary multilingualism. Therefore, literary multilingualism can, in turn, often be linked to the movement of people. But this is not always the case, as sometimes it is only texts (or fragments of text) that move and appear in new places and/or languages—as used to be the case, for example, with quotations from "the Classics." In the following, I will specify how the "immigration laws" of literature, as I will call them, are different from the immigration laws of language, and how they are related to literature’s politico-cultural agency, that is, the political stance literary texts take toward the ways in which we attribute significance to things. In more general terms, I suggest to reconceptualize scholarship in literary multilingualism as a "multilingual philology." In a final step, I will relate this approach to recent debates on World Literature and to questions of digitalization. Thereby, I will eventually also come into the position to specify how literary scholarship, as multilingual philology, can respond to the cultural aspects of "real" migration, that is, the migration of people. In a recent book on the history of grammar, Robert Stockhammer demonstrates that the development of "migration and integration policies" ("Migrations und Integrationspolitik," Stockhammer 2014, 318), that is, procedures that allow languages under certain conditions to incorporate what Quintilianus (2006) calls "migrating words" (verba peregrina; see Institutio Oratoria, I.5.55) from other languages, is an essential part of grammatical thinking. I take up this metaphor as it provides a useful link between literary multilingualism and migration, a link that is, as I hope to show, not purely metaphorical. In most cases, the status of migrating words in their new home remains uncertain. They are only partly "naturalized" in their new environment, maintain relations to their linguistic origins, and therefore have specific connotations, as French words in American English may often indicate (or aim at indicating) a sort of urban cosmopolitanism. Adorno’s famous formulation that foreign words are the "Jews of language" hints at this cultural polyvalence of migrating linguistic elements and structures—and, of course, at the amount of repression they have encountered from the side of linguistic purism (Adorno 1951, 200). How does literature relate to such forms of linguistic migration? One first item to look at is how literary texts represent multilingual communication. This is, as far as I can see, the first form of literary multilingualism that was explored by scholarship, even though it is by far not the only one. Most studies of this kind treat the languages involved as separate unities bound to individual, mostly "native speakers," and ask how speech in different languages is represented in monolingual texts. Illustration 1: Albert Uderzo; René Goscinny, Astérix et les Goths (Paris: Hachette, 2013 ). There are very different modes of representing such code-switching in literary texts, as in the overwhelming majority of cases, this representation proceeds indirectly (cf. Sternberg 1981). Many texts simply pretend that there are no language differences, even though the reader can easily infer the contrary. For instance, in medieval novels, the protagonists travel quite far without ever reaching the limits of their linguistic homeland (Classen 2013, 136–42). Very often, however, linguistic diversity is at least somehow indicated. The main principle of such indications can be inferred from the comic strip Astérix et les Goths by Albert Uderzo and René Goscinny from 1963 (see Illustration 1). Here, the difference between Gothic and Gaulish is indicated by two different typefaces and other graphic means. There are numerous examples for such "latent" representations of other languages in (seemingly) monolingual texts. In Shakespeare’s comedies, the use of blank verse and prose indicates, so to speak, the sociolects spoken by the aristocratic protagonists and the fools, respectively. In the Western fiction written by the German nineteenth-century author Karl May, at times the juxtaposition of standard German and Saxon dialect indicates that, in "reality," English (standard German) and German (Saxon) are spoken. A similar trick can be found in Franz Grillparzer’s mythological dramatic trilogy Das goldene Vlies (1819), where the Greeks speak in blank verse but the Colchians in (mostly) free verse. In this case, the different meters represent not only two sociolects, but two mutually unintelligible idioms—or at least a standard variety and the "accented" speech of the "barbaric" Colchians who do not master Greek properly (Weissmann 2016). A particularly popular example for the "latent," "indirect," or "implicit" literary representation of multilingualism (popular among scholars, that is) is Feridun Zaimoglu’s Kanak Sprak ( 2011), which uses an artificial idiom to evoke the speech of postmigrant (mostly Turkish) youths in Germany. The preface to Zaimoglu’s book announces the following texts to be "translated" interviews whose original tapes have been destroyed, a relatively open acknowledgment of the fact that the texts are really invented. The German term used to designate "translation" is Nachdichtung, that is, "poetic re-creation" (Zaimoglu [1995/1998] 2011, 19). It is thus to be understood that the idiom of Kanak Sprak is a literary construction. Yasemin Yildiz has demonstrated in her close reading of the text that what we see here is a mixture of (Northern) German dialect, "Hip-Hop English" (as Yildiz calls it), Yiddish, and elevated literary (at times also biblical) German (Yildiz 2012, 186). What all these cases have in common is a certain way of cultural camouflage. Linguistic elements and structures pretend to have migrated into another linguistic context. It is obvious that such an indirect representation of other languages will mainly work in fiction. But there is a more structural reason for the fact that it is possible to let linguistic differences, which are situated on different levels (e.g., differences between mutually unintelligible idioms, dialectal/sociolectal differences, differences in typeface or even just in meter), represent each other. In order to understand multilingualism, we need to move on to a more general, theoretical level. How can multilingualism be conceptualized from the point of view of literary scholarship rather than linguistics? Yildiz, in her seminal book, Beyond the Mother Tongue, starts out with an example that is too good not be mentioned here (Yildiz 2012, 1–3, 21–25). Karin Sander’s project, "Wordsearch," financed by the Deutsche Bank in New York, is an attempt to make linguistic diversity more visible. Sander asked native speakers of about 250 languages, all living in New York, to name a word in their mother tongue, which was then translated into the languages of all other participating native speakers; the result was presented in large tables that were published as a supplement to The New York Times. What is problematic about this experiment is not only the narrow-minded concept of translation at the core of the project. Rather, Yildiz argues that the project affirms a notion of monolingualism, according to which it is "natural" for any person to speak exactly one language as his or her mother tongue and that the different languages thus originating from their native speakers are easily transposable into one another. Thereby, the project becomes a prime example of the force of what Yildiz calls the "monolingual paradigm" (Yildiz 2012, 1). How can multilingualism be conceptualized from the point of view of literary scholarship rather than linguistics? I would like to add to this analysis that even though "Wordsearch" puts various linguistic elements into motion, the "immigration" of these elements into the artwork is accomplished by strict regulations. It is obvious that the master language of the project is English, the language into whose alphabet all the foreign names of the participants are transcribed. If we assume that most of these participants were migrants, it is implied that they, and their languages, find their way into the project only on the condition of subjecting themselves to the English language’s way of constituting significance. One could also say that one central operation upon which Sander’s project, and with it the monolingual paradigm, is based, is the act of reducing (cultural) complexity to distinct or, as I would prefer to say, digital units. Yildiz’s notion of the monolingual paradigm certainly is one of the most powerful and influential concepts in recent literary scholarship, and her analyses of the literary effects of the "postmonolingual condition" are pathbreaking for the interpretation of multilingualism as a feature even of seemingly monolingual texts. But there are other concepts that need to be credited to at least the same degree. For example, Thomas P. Bonfiglio has provided a thorough historical "deconstruction" of the notion of the native speaker, starting with Dante’s De vulgari eloquentia (around 1300) (Bonfiglio 2010; see also Derrida  1998); and David Martyn has highlighted the role of Johann Gottfried Herder in this process (Martyn 2014). Focusing on (post)colonial contexts, Makoni and Pennycook have claimed that any linguistic unity in the sense of langue is rather "invented" than given (Makoni and Pennycook 2005). David Gramling emphasizes that monolingualism in turn is "inventive" and produces or at least triggers specifically modern societal developments (such as democracy, scientific language, and the legal doctrine of the European Union) (Gramling 2016). As Naoki Sakai has shown in a widely received article, it is translatability that constitutes the notion of separate linguistic unities in the first place (Sakai 2009). Gramling speaks of the idea of universal "transposability" as the motor of modern monolingualism (Gramling 2016, 122–29). Stockhammer coined the German term Sprachigkeit ("lingualism"), which designates the degree to which an element or a structure of speech is bound to a certain idiom and thereby implicitly breaks with the presupposition that linguistic elements and structures generally make part of precisely one language (Arndt, Naguschewski, and Stockhammer 2007; cf. Martyn 2014, 49 ff.). Myriam Suchet has described literary multilingualism as a systematic subversion of the notion of langue (Suchet 2014). And Gramling proposes to adopt M. A. K. Halliday’s distinction of "glossodiversity" and "semiodiversity," which provides an alternative take on the description of linguistic diversity. Whereas glossodiversity is the multiplicity of separate codes, which "empowers speakers to say the same thing in many languages" (congruent with Yildiz’s description of the monolingual paradigm), semiodiversity designates the (uncontrolled) movement of dissemination that does not respect linguistic boundaries (Gramling 2016, 32). Langue is neither naturally given in linguistic reality nor is it a presupposition of speech. Any language as a unity distinct from (and translatable into) other languages is always an "invention," that is, the result of politico-cultural interference (i.e., that there have been successful efforts to regulate the way in which linguistic signification is organized in such a way so as to establish fixed rules for the identification of faulty expressions). A central part of this politico-cultural interference is the application of linguistic immigration laws. Multilingualism must not be described as the co-presence of at least two countable idioms, but as the co-presence of linguistic structures or elements which are, more or less, bound to different, more or less well-distinguishable idioms. This notion is congruent with the experience that the legal status of immigrants (which is digital by definition—either you are legal of you are not, 0/1) has nothing to do with the complexity of their cultural (and linguistic) affiliations. 3. What is Multilingual Philology? The epistemological as well as methodological impact of the insight into the "inventedness" of all linguistic unities can be further developed if one emphasizes the methodological difference between literary scholarship and linguistics. I would like to argue that the particularity of literary scholarship stems from its philological foundation, which is why I seek to claim multilingualism as a research area of genuinely philological interest (cf. for the following, Dembeck, Forthcoming). Philology, in the German sense of the word, is the study of (literary) texts in their historical singularity. As Peter Szondi demonstrated in an essay attached to his studies of Hölderlin, this definition implies that philology must acknowledge the potential significance of any detail, no matter how insignificant it may seem at first sight. In philology, the rule of the empirical sciences that a singular phenomenon does not have any relevance, that it does not "count," must not be applied (Szondi 1967). On the contrary, philology reserves the right to be interested in specific, singular phenomena, such as, for example, Kafka’s handwriting. Philology remains open toward seemingly "noisy" aspects of language use. Therefore, the editing process that is visible in Kafka’s manuscript of the Proceß can legitimately be taken into account when one interprets this novel, and as philologists, we will try to make sense of the ten words of thunder James Joyce inserts into Finnegans Wake, precisely because we will not find them in any dictionary (cf. Young 2016, 1213). To put it more generally, in philology, any seemingly noisy or ornamental element of the document might eventually prove to be meaningful. It is important to see that, contrary to philology, linguistics, as an empirical science, is eventually not interested in singularity. For the reconstruction of a langue, the slips and idiosyncrasies that happen to its speakers are not relevant, but only their competence to discern what can and what cannot be counted as correct in "their" language. Of course, this rather strict principle, which has been most snappily formulated in the early works of Chomsky (Chomsky 1965, 21), does not apply to all linguistic approaches. Many sociolinguistic studies (some of them mentioned above) have dropped the notion of langue and are rather interested in linguistic "super-diversity" (Blommaert 2010) and the individual choices made by speakers. But even in this case, it is statistical evidence extracted from data that counts. Linguistic research is therefore based on the construction of countable units. The linguistic description of any langue will start out with the establishment of phonemic units upon which the respective language is built. And it is precisely the constitution of these digital units, and of the rules that allow correct combinations of them to more complex unities (e.g., morphemes, phrases), which grants the unity of langue. But also, linguistic super-diversity can only be grasped after a process of digitalization (or transcription, which is basically the same) has been accomplished. 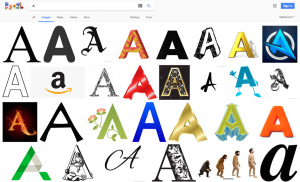 Illustration 2: Result of a Google image search for "A" (8 April 2017). In philology, of course, the constitution of digital units also is a primary objective: Philologie and literary scholarship in general make a business of "constituting text" on different levels. However, any philological argument must, at the same time, always remain skeptical about what it has constituted. On the one hand, it is our job to figure out what is significant in what we read: we must, for example, be capable of seeing the letter "A" in (almost) all figures to be seen in Illustration 2. In this sense, we always engage in a reduction of complexity that is congruent to the act of digitalization, which is at the heart of the constitution of linguistic facts in the sense of linguistics. On the other hand, we must always stay aware of the fact that anything we have neglected in the process might be significant in some other way. We must therefore always remember that any "A" is always accompanied by a lot of ornament or noise, which is still somehow attached to it, just as any spoken word is accompanied by a lot of phonetic qualities that do not show in its phonemic transcription (see Dembeck 2013a). From these rather general thoughts, we can draw immediate conclusions about the preconditions of multilingual philology: If for philology, any noise is potentially significant, this notion also applies to linguistic noise; that is, any interference with the integrity of the one idiom within which a text is seemingly written is potentially meaningful. Multilingual philology, as any philology, remains skeptical about its own methods of digitalization, which implies that it cannot take the constitution of linguistic facts in the text for granted; it must always be open to reconsider seemingly obvious linguistic categorizations. In other words, multilingual philology does not presuppose that any text is written in one language, but rather asks which "languages" the text uses, or even constitutes, and how these languages relate to one another. In a different vocabulary, one could also say that the objective of multilingual philology is to develop the means for the sensitive detection of traces of linguistic migration in literary texts. Multilingual philology does not presuppose that any text is written in one language, but rather asks which "languages" the text uses, or even constitutes, and how these languages relate to one another. As far as I can see, all the positions quoted above, which oppose concepts of multilingualism as a sheer pluralization of monolingualisms, are, though maybe unconsciously, based in this philological attitude: Their critique of the monolingual paradigm and of the linguistic concept of langue implies an interest for what might appear to be linguistic noise—or "semiodiversity," in Gramling’s terms. Contrary to this, the presupposition of langue, be it in linguistics or in literary scholarship, appears as a reduction of complexity, an a priori digitalization of linguistic reality, of which the singular case must always escape. Thus, when we as philologists set out to investigate the very different literary usages of multilingualism, we must, in contrast to research in linguistics, derive our model of language difference in texts from this focus on singularity. This stance does not mean that we cannot make use of linguistic categories; however, from a philological perspective, any such categorization must always be taken to be provisional. A systematic reconsideration of the linguistic structure in the literary text is therefore compulsive for multilingual philology, which is, by the way, essentially the same movement as going back to Kafka’s handwriting, just related to a different aspect of the text. Another way of putting this idea is that as a philologist, one must presuppose that any (literary) text establishes its own immigration laws with respect to any linguistic elements and structures; that is, any text is autonomous in the sense that any linguistic regularity to be observed in it is something the text has subjected itself to. From this point of view, grammatical constraints are no different from constraints imposed by rhetoric or aesthetic strategies. This holds notwithstanding the fact that no text can ignore the necessities of having to accommodate to its readers’ competences, which makes it highly improbable that a text will invent an altogether new language (although there are also examples for this invention). In this hypothesis, we have found the deeper reason for the fact that it is possible to represent, for example, different, mutually unintelligible languages through different meters, as is the case in Grillparzer’s Das goldene Vlies. It is the functional equivalence, with respect to their disposability as constraints for the individual text, of differences between mutually unintelligible idioms, various dialects, sociolects and other varieties of "one language," different esthetic, stylistic, or rhetoric strategies at work in a text (such as different meters), or even artificial constraints, that enable (literary) representation to replace one set of differences with an analogous set of differences from a different level. And insofar as some variety with respect to these different structural levels will be found in any text, it is now possible to declare that multilingual philology can, in principle, be applied to any text: Any text can be read as a multilingual text. There is no "zero degree" of linguistic purity in texts written as so-called natural’ language. A monolingual text, in my eyes, is conceivable only as a text written in a machine language (i.e., a language that can process digitalized units only). The hypothesis that literary texts establish their own immigration laws must be taken as a purely methodological presupposition, which is, however, constitutive for the philological approach; it does not mean to say anything about the ways literary texts are produced in reality. Of course, the specific linguistic competence of authors, the restrictions of the publishing industry (see Lennon 2010), and generally the politico-cultural context do influence the linguistic decisions that shape the individual text. Looking at texts as if they were fully autonomous in the choice of the linguistic regimes they subject themselves to, however, gives us the sensitivity that we need in order to explore the intrinsic multiplicity of literary multilingualism. Still, one could get the impression that multilingual philology leads into a methodological dead end: Can it eventually be more than the self-sufficient application of an algorithm to detect linguistic diversity on the various structural levels of the literary text? Even though I strongly believe that any result of such an algorithmic analysis of a literary text can be the object of rich interpretations, and even though it certainly is a surplus for literary scholarship to be able to differentiate between divers forms of literary multilingualism, multilingual philology would indeed lose its interest if it neglected the fact that interest in literary multilingualism was, in the first place, triggered by the problem of incomprehensibility: Literary multilingualism is interesting because and insofar as it engages idioms that are mutually unintelligible. This interest arises because problems of comprehension are charged with so many ethical, political, and, before all, politico-cultural questions. Multilingual philology should not miss the opportunity to relate to these questions. Therefore, my suggestion is to embrace the methodological implications of multilingual philology, but at the same time to concentrate on such texts that in one way or the other deal with differences between (more or less) mutually unintelligible idioms. That is to say, we must never, when we read text that latently of manifestly involves two or more such idioms, leave it at that and start interpreting; rather, we should always take into account how linguistic structures on other levels relate to these idioms. Rainier Grutman was among the first to explore the relationships between different forms of linguistic diversity in literary texts in his studies on nineteenth-century novels from Québec; his definition of literary "hétérolinguisme" explicitly includes sociolectal and dialectal variation (Grutman 1997, 37). Yildiz, in her work on Zaimoglu and others, proceeds similarly; and Werner Helmich’s book on the Aesthetics of Multilingualism (Helmich 2016), which provides a very extensive account of literary multilingualism in the Romance languages and in German, although starting out with the objective to only consider differences between mutually unintelligible languages, is, in its detailed analyses, forced to include dialactal, sociolectal, rhetorical, and other aspects of the texts. One could also say, in the vocabulary proposed in this essay, that reading a text in terms of multilingual philology (i.e., investigating which are its linguistic immigration laws and how it applies them) is most interesting in cases when these laws involve idioms that potentially affect the accessibility of the text itself. By using at least two mutually unintelligible idioms, in most cases a text, so to speak, closes its borders to many readers who might have found it accessible if it would have been written in one language only. Questions of accessibility, however, are also relevant if a text only latently involves such idioms, as is the case in most of the examples I have already mentioned. The decision not to present a language, but to have it represented by some other linguistic constraint, has politico-cultural implications, too. One could also say, in the vocabulary proposed in this essay, that reading a text in terms of multilingual philology (i.e., investigating which are its linguistic immigration laws and how it applies them) is most interesting in cases when these laws involve idioms that potentially affect the accessibility of the text itself. Looking at the question of accessibility, Brian Lennon has proposed to differentiate between "weak" and "strong" multilingualism (Lennon 2010, 17), with "weakly multilingual texts" providing a sufficient degree of redundancy to enable even a monolingual reader to understand parts written in an unknown language, while "strongly multilingual texts" abstain from such concessions. The novels of May and Grillparzer’s drama are certainly very good examples of weak multilingualism, as they spare their readers the confrontation with English, Greek, and Colchian (or Greek with a Colchian accent). Lennon’s distinction is in general very useful, even though one must say, as Lennon himself also shows, that even seemingly weak forms of literary multilingualism can provoke a high degree of irritation in monolingual readers. For the purpose of multilingual philology, it is therefore inevitable to assess the particular politico-cultural implications of literary multilingualism in its various forms on the basis of individual cases. One might thereby come to the conclusion that Joyce’s Finnegans Wake, in its extremely strong form of multilingualism, rather fails to evoke any politico-cultural effect simply because its degree of inaccessibility is too high to challenge the ways in which readers perform culture (i.e., make the world significant). Contrary to this, Zaimoglu’s weak multilingualism in Kanak Sprak has immense politico-cultural implications. As it successfully entails the impression of foreignness within the German language itself, it not only subverts the expectations of the German literary scene of the 1990s, but it makes visible that a language, which many Germans probably thought to own as their mother tongue, can be and has been alienated, so to speak, "from the inside." Whereas Grillparzer’s and May’s texts follow an agenda of linguistic and cultural appropriation, Zaimoglu’s Kanak Sprak aims at foreignizing German literary language. The politico-cultural impact of the text was probably to a larger degree generated through this strategy rather than through depicting postmigratory realities in contemporary German society. If multilingual philology can provide a strategic program for literary scholarship, it must systematically combine algorithms for detecting linguistic variety in texts, with the assessment of the texts’ strategies to manage their accessibility and relate these strategies to the politico-cultural context into which the texts inscribes themselves. This context, to a large extent, is shaped by contemporary language policies and by historical semantics of language diversity, such as the notion of the native speaker, of sacred languages, and of linguistic purity. As a singular case, of course, any text is also inscribed in much more concrete networks of societal, cultural, political, and economic constellations. Ultimately, the politico-cultural "agency" of a text can only be fully appreciated if one understands how the "association," as Bruno Latour might call is, of divers linguistic means within the text engages with associations that surpass the limits of textuality (see Latour 2005). Literary texts can, in a very literal sense, associate fragments of other text and links to other contexts by means of quotation. This association can be immediately linked to the topic of linguistic migration in what I like to call "heterolingual quotation." Any quotation can be described as the passage from one speech (one parole) to another, relating one speech to another "foreign" speech. This relation to foreign speech is constituted by, first, the act of a more or less literal repetition, and, second, by a more or less explicit reference to the original source. A heterolingual quote, then, is a quote that involves a linguistic difference between the quoted text and the quoting text. Heterolingual quotation performs not only a migratory movement from one (singular) text (parole) to another, but also from one linguistic context to another. In theory, one could be rather generous in the attribution of this label and, for example, also consider the citation of verse in a prose text a heterolingual quotation. It is more promising, however, to speak of heterolingual quotation in such cases that make it necessary to decide if one would rather translate the quote or leave it in the original; that is, when the two languages involved are (more or less) mutually unintelligible. After all, these are the cases where questions of accessibility and therefore of cultural-politics are immediately raised. This may, at first sight, be a rather weak or metaphorical link to the topic of migration if migration is understood as a movement of people. Still, I would like to argue that heterolingual quotation, in its structure, is congruent to the movement of persons into new (social, cultural, linguistic) contexts, and that multilingual philology is therefore well suited to detect the cultural effects of real migration in (literary) texts. Heterolingual quotation is migration of singular structures and elements from different textual and linguistic contexts. And just as real migrants have to redefine their identity in their new environment while they remain connected to their former existence, the singular elements and structures which are subject to heterolingual quotation take on new meaning while still being related to the singular historical circumstances (even if they are unknown) of their origin. From an analytical point of view, what is interesting to look at is, first, the degree of "literality" in heterolingual quotation, which depends both on the fidelity of the transcription and on the fidelity of translation, as a translated quote from a different language remains, in a certain way, a heterolingual quote. Second, it is important to think about the range of reference of each individual quotation. I would like to argue that heterolingual quotations transport their original linguistic context to very different degrees. A quote may represent not only the individual text it is taken from, but also (or even rather) the historical or linguistic context it comes from. Or it may try to delimit its connotations to a singular situation. This is the case of a heterolingual quotation in the poem "Schibboleth," by Paul Celan, upon which I would like to elaborate. hier, in der Mitte des Marktes. here in the midst of the market. Having been pulled onto the market place, the speaking subject urges its own heart to remain loyal to its political attitude by shouting out "No pasaran," thereby not giving in, and eventually proving wrong the enemies’ (the Fascists’) assumption that they have won. After all, they have not gotten through; they have not passed into the heart of the one they execute. A second heterolingual quotation we find in the title of the poem, and this is what Derrida’s reading mostly comments upon: "schibboleth." In the Old Testament’s Book of Judges, the Ephraimites, who were known for the linguistic defect of not being able to produce (or even distinguish) the sound "sh," while fleeing from their enemies and having to cross a river in the process, were asked to say "shibboleth." They pronounced the word as "sibboleth" and were killed. Derrida points out that "shibboleth" and "sibboleth" are two phonetic variants of the same Hebrew word, which implies that in this story, a seemingly insignificant linguistic difference became "divisive"; that is, the occasion for a deadly exclusion. It keeps the Ephraimites from passing—it literally means "no pasarán." Celan’s poem in a way inverts this situation, for the utterance of the schibboleth "no pasaran" not only postulates, but effects that the enemies, the Fascists, will not pass. That is to say, those who are willing to kill upon the occasion of a contingent excluding marker to which they contribute a fixed decisive meaning do not see that the irreducible singularity of the subject can never be subsumed under any generalizing concept. The "no pasaran" as the saving word must remain illegible to any generalizing approach. It is self-assertive in that it eventually remains opaque to the enemies, and to anyone else. The poem "Schibboleth," then, also establishes a position of resistance vis-à-vis the exclusive cultural-politics of contemporary literary circles. What does it mean, in this context, that Celan introduces the Spanish "no pasaran" into his German poem? Why and how does this quote from another language migrate, or rather pass, into the poem? It is, on the one hand, appropriated as a symbol of the irreducible singularity of the subject. At the same time, however, it remains foreign to its new environment, or rather, it remains unclear just how foreign it remains to this new environment. Celan, so to speak, quotes Spanish with an accent because there is, literally speaking, an accent missing in the quote: In Spanish, "no pasaran" should be written with an accent on the last syllable. Without this accent, the word should be pronounced "no pasáran." Has the shibboleth, then, conformed to German, accentless orthography? Or has Celan just made a mistake? We cannot really say, and this may very well be the main point of the poem: the shibboleth "no pasaran" remains illegible not only to the enemies of the speaking subject but also to us readers, and this is an effect of the linguistic difference between the quote and the quoting text. We, the readers, cannot pass into the poem; it remains inaccessible with regard to any interpretation that would aim at reducing its complex structure to a distinct meaning. It should not be forgotten that the question of "accent" was of immediate relevance to the politico-cultural context of (West) Germany in the 1950s. Celan was made aware of this fact in a rather unpleasant way when he read some of his early poems at a meeting of the Gruppe 47 in 1952. The assembled literary élite of the newly founded West German state was not at all sensitive to Celan’s poetry, and it has been established that this was to a large extent due to the way he declaimed his poems, among them the famous "Todesfuge" (Epping-Jäger 2007). The poem "Schibboleth," then, also establishes a position of resistance vis-à-vis the exclusive cultural-politics of contemporary literary circles. Celan’s poem demonstrates that literary multilingualism can shape very particular literary and politico-cultural positions which must be seen in relation to the place in the world in which they have come to stay. In their inherent linguistic diversity, literary texts reach out to the world as it is shaped by languages, by literature, culture, society, and so on, in very different forms and following very different strategies. How can multilingual philology relate to this observation? And how can it thereby reflect upon discussions of World Literature? Linguistic diversity is at the center of any conceptualization of World Literature, and therefore many discussions in the field focus on the politico-cultural status of different languages, on hegemonic structures in the relations between these languages, on questions of translation, and, finally, on questions of the scope of reading (close vs. distant). It is obvious that the assessment of the politico-cultural interrelations between languages and the societies they (sometimes) represent are of immediate interest for any assessment of literary multilingualism. With regard to translation, the two most renowned positions certainly have been formulated by David Damrosch, for whom World Literature is "not an infinite, ungraspable canon of works but rather a mode of circulation and reading," which is triggered, to a large degree, by translation (Damrosch 2003, 5); and by Emily Apter, who argues that World Literature can only be appropriately envisioned if one respects the individual works’ untranslatability (Apter 2013). Multilingual philology can relate to both positions. If literary multilingualism is linguistic migration, then World Literature can alternatively be described as a mode of migratory circulation, that is, of transfers out of and into linguistic contexts; and it is, at the same time, a movement that evokes, or makes visible, resistance against the all too easily made assumption that anything is transferable—or translatable. If we presuppose that any text establishes its own immigration laws and that these laws are generally linked to its politico-cultural stance toward linguistic and, eventually cultural diversity, multilingual philology is an instrument to detect a movement of linguistic diversity through the cultural sphere, which is at least one of the factors that constitutes World Literature. As I have already stated, any transfer of linguistic constraints can indicate a "merely" cultural migratory movement, not necessarily linked to the movement of people (i.e., "real" migration). This, however, does not mean that deciphering these "merely cultural" movements would not teach us something about the cultural effects of the ceaseless migration of people, which constitutes a big part of human history. Of course, the causes, contexts, and consequences of real migration have to be described politically, socially, and economically, which is the objective of other disciplines. But the application of a philological point of view, if one keeps in mind that any constellation of linguistic constraints in a literary text has, consciously or unconsciously, politico-cultural implications, establishes a perspective of its own right on the phenomenon. Multilingual philology can create an awareness of how linguistic diversity performs cultural diversity, that is, the diversity in how to make things significant. After all, what we see in literary multilingualism is something that also happens when people migrate into new places: the interaction between different modes of attributing significance to things, and the negotiation of the mechanisms that establish which differences shall be of relevance in communication. Insofar as cultural differences are nothing but differences in making things become significant, literary multilingualism explores alternative ways of dealing with cultural differences. And it can promote a mode of reacting to this awareness that is governed by interest rather than by rejection (cf. Baecker  2003, 57). I would like to end this paper with an aside concerning an instrument of scholarship in World Literature which I have now and then alluded to: digitalization. Is there, or could there be, something like digital multilingual philology? Philology, I have argued, consists of the operation of constituting significance, which essentially is an operation of digitalization, while, at the same time, systematically remaining skeptical about the results of any digitalization. This already implies a preference for close reading—as opposed to distant reading which, for the time being, presupposes an already accomplished process of digitalizing text. There is no distant reading of hardly legible manuscripts, at least not yet. Thus, even though the "toolbox" of multilingual philology provides something like an analytical algorithm which, in theory, is applicable to all texts, the presuppositions for its automated application remain to be established. Any serious datamining in this field (i.e., the automatic recovery of the linguistic diversity in large volumes of text) would presuppose very well-functioning algorithms for language recognition, which would have to be coordinated with algorithms that detect constraints on all levels of the linguistic structure. One would need well-functioning machine translation to detect, for example, translated heterolingual quotations, not to speak of the fact that computers would have to be capable of recognizing an accent if they hear one (cf. Dembeck 2010). This contribution was first presented in the Multilingualism as Migration event on April 11, 2017 at Duke University. My thanks go to the Franklin Humanities Institute and the Department of Germanic Languages and Literature at Duke who sponsored the event, to Jakob Norberg, who organized it, and to all participants who contributed considerably to the clarification of the argument, particularly Kata Gellen, Prycilla Layne, Jakob Norberg, and Thomas Pfau. Very recently, Robert J. C. Young, has published an article in PMLA that reproduces some of the claims I have cited here, but relates only to parts of the discussion (Young 2016). Of course, this statement does not at all reflect the experience of many migrants who are in limbo due to lack of documents, for example. However, this experience of "being nowhere" is the result of the obligation to be either the one or the other: either legal or illegal. It is perhaps not superfluous to add that many disciplines are methodologically based in contrafactual presuppositions; just think of linguistics and its presupposition that langues somehow and somewhere actually exist. Apart from the already mentioned works by Bonfiglio, Yildiz, Martyn, and Stockhammer, one can rely on a number of other excellent studies (e.g., Borst [1957–1963] 1995 and Trabant  2006). For a more developed reading of the poem in the context of the whole cycle, see Dembeck 2013b, 15–25. Adorno, Theodor W., and Minima Moralia. 1951. Reflexionen aus dem beschädigten Leben. Frankfurt a. M.: Suhrkamp. Apter, Emily. 2013. Against World Literature: On the Politics of Untranslatability. London: Verso. Arndt, Susan, Dirk Naguschewski, and Robert Stockhammer. 2007. "Einleitung: Die Unselbstverständlichkeit der Sprache." In Exophonie: Anderssprachigkeit (in) der Literatur, edited by Susan Arndt, Dirk Naguschewski, and Robert Stockhammer, 7–27. Berlin: Kadmos. Baecker, Dirk. (2000) 2003. Wozu Kultur? Berlin: Kadmos. Bonfiglio. Thomas P. 2010. Mother Tongues and Nations: The Invention of the Native Speaker. New York: Mouton de Gruyter. Borst, Arno. (1957–1963) 1995. Der Turmbau von Babel: Geschichte der Meinungen über Ursprung und Vielfalt der Sprachen und Völker. München: dtv. Celan, Paul. 2001. Selected Poems and Prose, translated by John Felstiner. New York, London: Norton. ———. 2004. Von Schwelle zu Schwelle, vol. I.4.1 of Historisch Kritische Ausgabe, edited by Holger Gehle. Frankfurt a. M.: Suhrkamp. Classen, Albrecht. 2013. "Multilingualism in the Middle Ages and the Early Modern Age: The Literary-Historical Evidence." Neophilologus 97 (1): 131–45. Damrosch, David. 2003. What Is World Literature? Princeton: Princeton University Press. Dembeck, Till. 2010. "Kann man Kultur digitalisieren?" Weimarer Beiträge 3: 421–31. ———. 2013a. "Reading Ornament: Remarks on Philology and Culture." Orbis Litterarum 68 (5): 367–94. ———. 2013b. "‘No pasaran’ – Lyrik, Kulturpolitik und Sprachdifferenz bei T. S. Eliot, Paul Celan und Rolf Dieter Brinkmann." arcadia 48 (1): 1–41. ———. Forthcoming. "Multilingual Philology and ‘Monolingual’ Faust: Theoretical Perspectives and a Reading of Goethe’s Drama." German Studies Review 41 (3). Derrida, Jacques. (1996) 1998. Monolingualism of the Other, or, the Prothesis of Origin. Stanford: Stanford University Press. ———. (1986) 2002. Schibboleth. Für Paul Celan. Wien: Passagen. Epping-Jäger, Cornelia. 2007. "Stimmbrücke. Celan liest in Niendorf," In Deixis und Evidenz, edited by Horst Wenzel and Ludwig Jäger, 195–215. Freiburg i. Brsg. : Rombach. Gramling, David. 2016. The Invention of Monolingualism. New York: Bloomsbury. Grutman, Rainier. 1997. Des langues qui résonnent. L’hétérolinguisme au XIXe siècle québecois. Montréal: Fides. Helmich, Werner. 2016. Ästhetik der Mehrsprachigkeit. Zum Sprachwechsel in der neueren romanischen und deutschen Literatur. Heidelberg: Winter. Latour, Bruno. 2005. Reassambling the Social. An Introduction to Actor-Network-Theory. Oxford: Oxford University Press. Lennon, Brian. 2010. In Babel’s Shadow: Multilingual Literatures, Monolingual States. Minneapolis: University of Minnesota Press. Martyn, David. 2014. "Es gab keine Mehrsprachigkeit bevor es nicht Einsprachigkeit gab: Ansätze zu einer Archäologie der Sprachigkeit (Herder, Luther, Tawada)." In Philologie und Mehrsprachigkeit, edited by Till Dembeck and Georg Mein, 39–51. Heidelberg: Winter. Quintilianus, Marcus Fabius, 2006. Institutionis Oratoriae libri XII. Ausbildung des Redners. Zwölf Bücher, edited and translated by Helmut Rahn. Darmstadt: Wissenschaftliche Buchgesellschaft. Sakai, Naoki. 2009. "How Do We Count a Language? Translation and Discontinuity." Translational Studies 2 (1): 71–88. Sternberg, Meir. 1981. "Polylingualism as Reality and Translation as Mimesis." Poetics Today 2 (4): 221–39. Stockhammer, Robert. 2014. Grammatik: Wissen und Macht in der Geschichte einer sprachlichen Institution. Berlin: Suhrkamp. Suchet, Myriam. 2014. L’imaginaire hétérolingue. Ce que nous apprennent les textes à la croisée des langues. Paris: Garnier. Szondi, Peter. 1967. "Über philologische Erkenntnis." In Hölderlin-Studien: Mit einem Traktat über philologische Erkenntnis. Frankfurt a. M.: Suhrkamp. Trabant, Jürgen. (2003) 2006. Europäisches Sprachdenken: Von Platon bis Wittgenstein. München: Beck. Weissmann, Dirk. 2016. "When Austrian Classical Tragedy Goes Intercultural: On the Metrical Simulation of Linguistic Otherness in Franz Grillparzer’s The Golden Fleece (1820)." Presentation at the University of Luxembourg, September 9, 2016. Yildiz, Yasemin. 2012. Beyond the Mother Tongue: The Postmonolingual Condition. New York: Fordham University Press. Young, Robert J. C. 2016. "That Which Is Casually Called a Language." Publications of the Modern Language Association of America (PMLA) 131 (5): 1207–21. Zaimoglu, Feridun. (1995/1998) 2011. Kanak Sprak. Koppstoff. Die gesammelten Mißtöne vom Rande der Gesellschaft. Köln: Kiepenheuer & Witsch. This work is licensed under the Creative Commons Attribution-NonCommercial-ShareAlike 4.0 International License. The images in this work are not subject to this license.